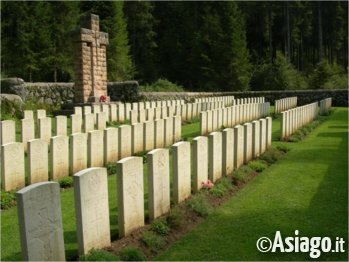 Excursion in the great war with the Asiago Plateau Guides-"San Sisto Ridge, Barenthal, June English blood"
The excursion is considered easy walking, even by non-expert hikers. This course is ideal for those who want to know a little-known aspect of the great war, the Allied Intervention to defend the southern edge of the plateau, ideal barrier containing the Imperial Army on the chain of mountains in the bulwark Venitian plain. In November 1917, to parry the consequences of Caporetto, arrives in Italy the British expeditionary force B.E.F. 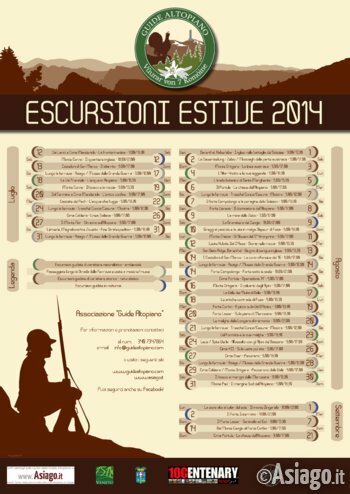 (British Expeditionary Force Italy) in addition to mortars, gunners, engineers and logistics. The British introduced new tactics: they precede the offensive with a night of war patrols. This is to avoid the immobility of the trench warfare: it tended to lead men into a State of passivity. There are many stories related to these departments: some speak of sports meetings to dampen tension of wartime, other battles were won thanks to Rum dropped into enemy hands. The last assault triggered the October 29, 1918 towards the location of Vezzena, so on the evening of 2 November the British in tents at Osteria del Termine, former border with prominent Slovenes Empire.